London has no shortage of homegrown animated inhabitants: Paddington Bear, Dangermouse, 101 Dalmatians, Peter Pan, and the Pearly Kings of Mary Poppins are just the dusting on the celluloid. But sometimes, cartoon characters from elsewhere pay us a visit. Here are a few favourites. 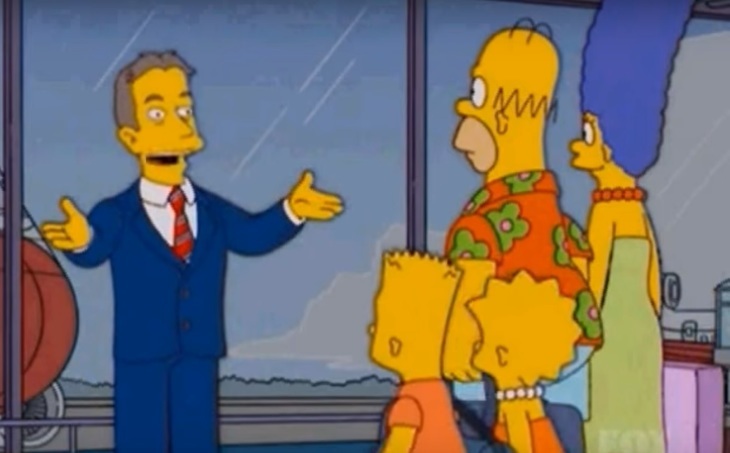 Prime Minister Tony Blair greets The Simpsons. The Simpsons chose our fair capital for a holiday back in 2003. Season 15's The Regina Monologues features guest appearances from the likes of Tony Blair, Ian McKellen and JK Rowling. (Blair's cameo apparently took eight months of negotiation to arrange, and was finally recorded during the height of the Gulf War.) The family visit many of the capital's landmarks, but sadly fail to spot that we have our very own Springfield Park, in Hackney. Key scene: The Simpsons, driving a Mini Cooper, get stuck on the Victoria memorial roundabout at the end of The Mall. In a desperate bid to escape, they crash through the gates of Buckingham Palace and trash the Queen's golden coach. Homer is locked in the Tower. 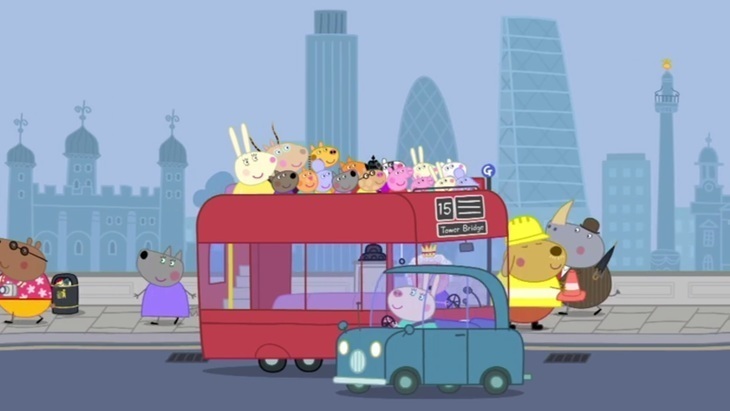 Peppa and her chums take a playgroup outing to London in a season 5 episode (2017). Like The Simpsons, they quickly make a beeline for the Palace, where Miss Rabbit's friend The Queen greets them. Her Majesty takes the young animals on a double-decker tour of the capital. Read our full, detailed analysis here. Key scene: The Queen refuses to wait for Tower Bridge to close and leaps the gap in her double-decker. The scene mirrors a real life event. In 1952 — the year of the Queen's accession — bus driver Albert Gunter jumped the river in a number 78 bus. England and London have been parodied many times in the show, though as far as we're aware, the family have paid only one quick visit during the 2002 episode Road To Europe. A more lengthy exploration (piss take) of British culture came in the episode Viewer Mail #2 (2012). 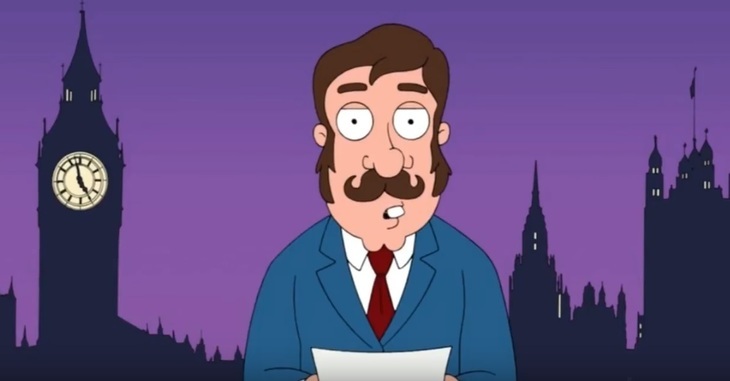 A five-minute segment imagines Family Guy set in the fictional English town of Billingsbury during a royal visit. Viewers of a Royalist persuasion should probably avoid the episode, which features the Queen's apparent death in a road tunnel. Key scene: "My favourite part before the Queen arrives is yelling 'wanker' at Prince Charles as he passes." Cue lots of calls of 'wanker' from the crowd, and Prince Charles nodding in agreement. Unless you've got small children, you might not be familiar with this CBeebies staple. 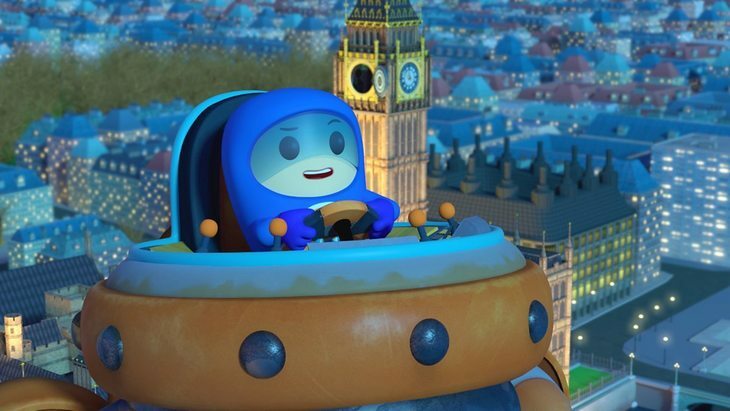 For the uninitiated, the Go Jetters travel the world, saving iconic landmarks from the hapless Grandmaster Glitch, while learning disco moves from a mask-wearing unicorn. It's not exactly Blue Peter. In an accidentally topical episode, the team arrive in London to find that Big Ben has been silenced... not by restoration workers, but by the sleepless Glitch who wants some peace from its bongs. He and his minions steal the bell from the tower on the eve of New Year. Key scene: Kyan suggests they use a giant magnet to recapture the bell, which is being towed through the skies over the Thames. Foz points out that Big Ben is made of copper and tin, neither of which are magnetic. That's some pretty smart science for a preschool show. It's not just animated characters who get a UK stamp in their passports. The comic book version of Batman also swooped by in 2010. 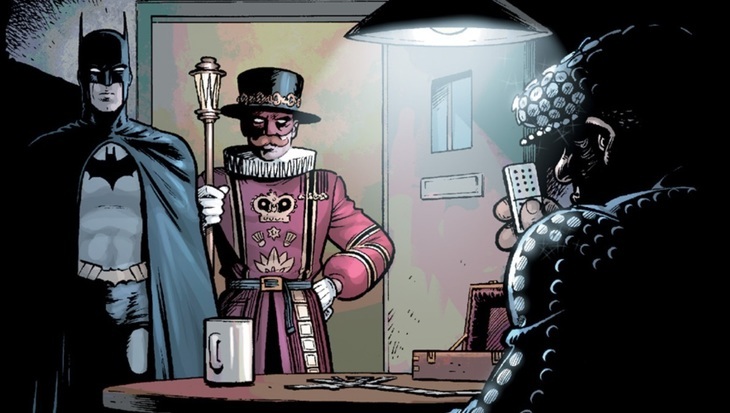 Here, the Caped Crusader, accompanied by a beefeater, interrogates an evil Pearly King in the basement of the Tower. It could happen. Meanwhile, Lego Batman has also been spotted hanging from the buildings, and kerbs, of our city. Feel free to suggest additions and omissions in the comments below.